Upon checking into the airport I was told that first class passengers had their individual boarding gate. I opted for a cup of coffee and some pastries before heading to my gate. I was rather speechless slash mind blown upon arriving at my Suite. I couldn't believe how much space there was. The flight attendant then offered me Arabic coffee and dates - followed by a refreshing hot towel. The incredible Automated bar filled with water, orange juice and Pepsi. At the rear end of the aircraft (as a Business or First Class passenger) you'll have access to the bar. It's a spacious place to stretch your legs and kill time. 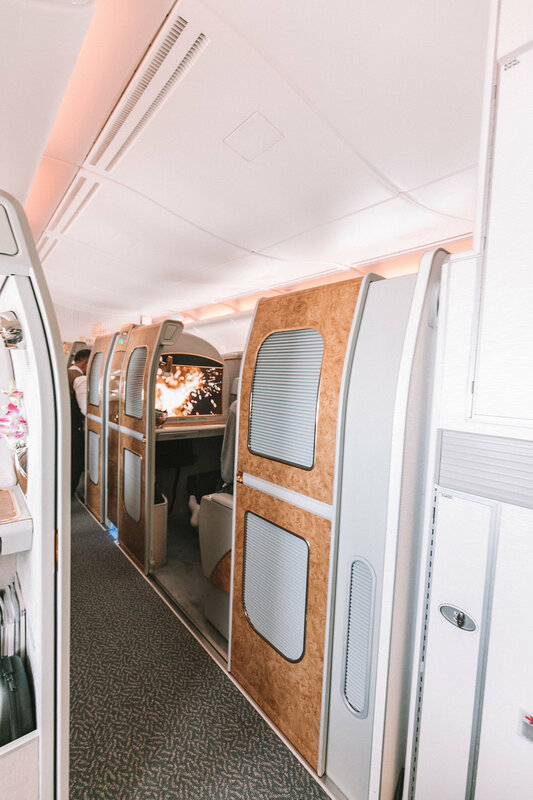 A vast array of drinks and snacks are available and are prepared by the bartender throughout the entire duration of the flight! I was shocked at the full à-la-carte, on-demand dining. 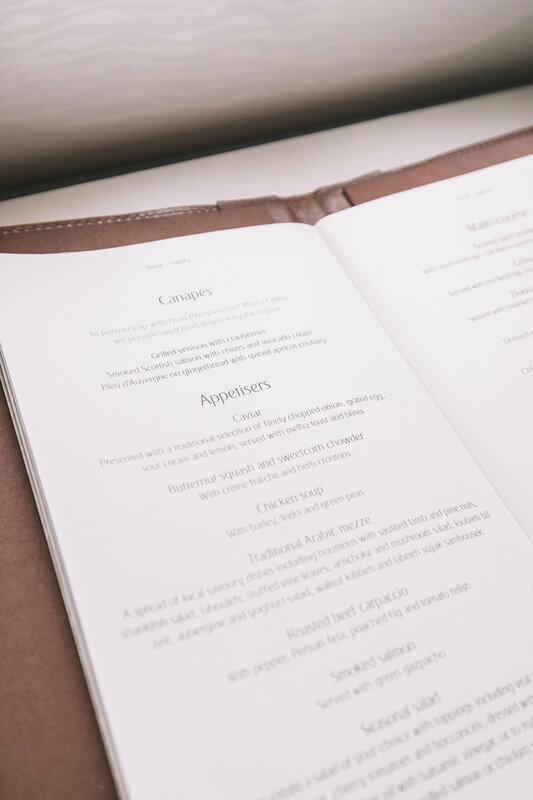 You can pick any dish, anytime, throughout the entire flight. I was handed a menu shortly after taking off. 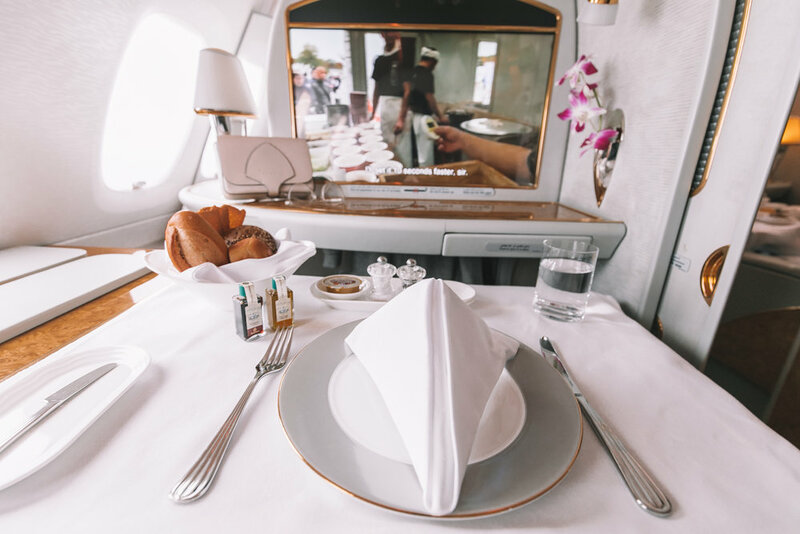 The flight attendant was extremely attentive and converted my seat into a mini-dining area, complete with a table cloth and Royal Doulton china. For my appetisers I opted for the Caviar. it was presented with a traditional selection of finely chopped onion, grated sour cream and lemon, served with melba toast and blinis. The first thing I noticed was how detailed the plating was. Served with a basket of freshly baked bread and butter - I was shocked at how elegant the dining experience was. The flight attendant kindly recommended the grilled tiger prawns for my main course. Dressed with lemon and herbs, served on pappardelle - the dish was beautifully seasoned and filled me up perfectly. For dessert it was between the chocolate ricotta pudding or raspberry pistachio mousse -I decided to go for the crumble and whipped cream pudding. Each seat also offers charging for your USB devices with a large storage area for your belongings. When you’re ready, just ask the crew member to turn down your seat into a bed and you’ll find a mattress pad, quilt and sheets laid out on your return ready for rest! 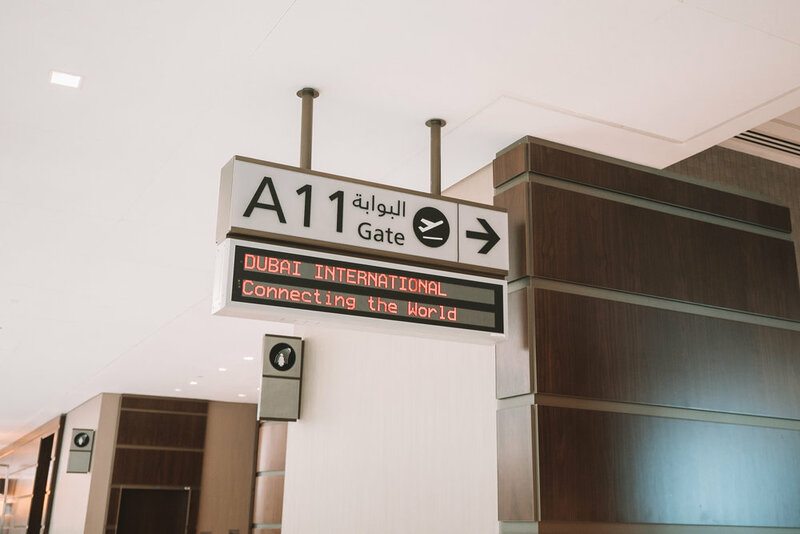 The best part of the Emirates Suites are the automated doors. To open or close your suite doors, you simply press a button and the door will slide open or shut. I found this quite handy when eating or watching a movie - you could do so in total privacy! 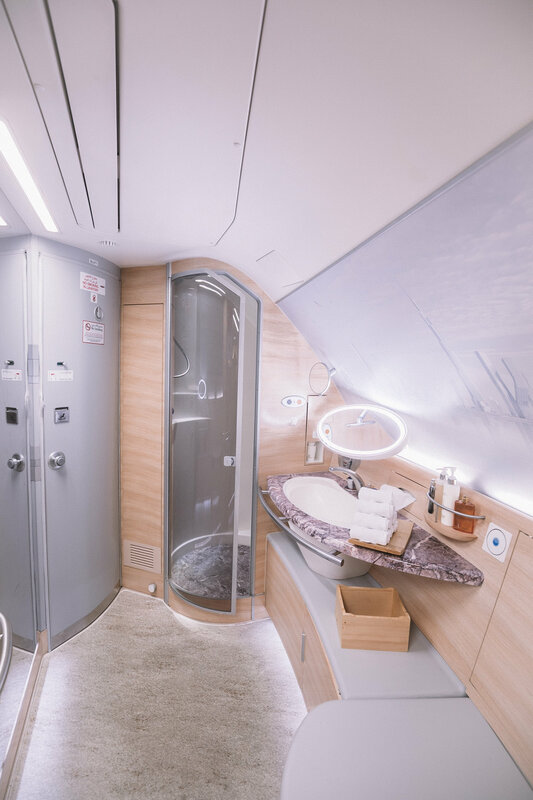 The highlight of my experience on the Emirates A380, was being able to shower on-board as a First Class passenger. Two hours before descending into Sydney my flight attendant came over and politely woke me up notifying me that my shower was ready. Each passenger is entitled to a five minute shower with an overall time of 30 minutes in the bathroom! There is also a hair dryer for you to dry your hair. Thank you to the staff for making this such a memorable one for me. It's going to be hard returning to a normal flight after this!